Photo by Dan Menten A little adventure and a little romance on Ruth Lake. 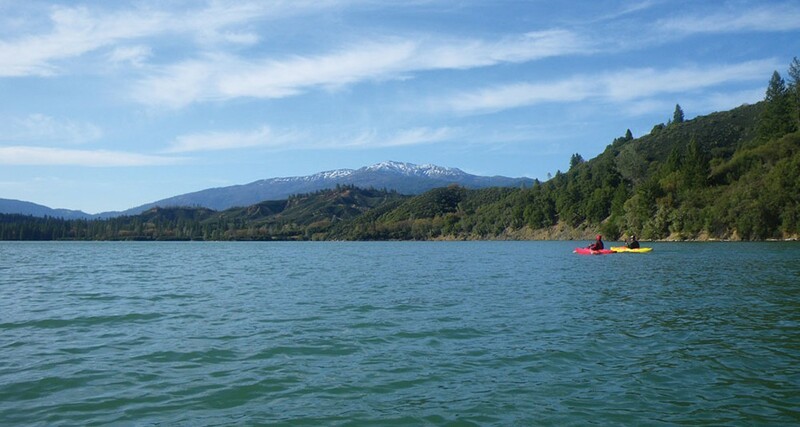 Getting on the water in a kayak rewards the adventurous with golden-ticket access to the beaches and hidden estuaries of Humboldt County. Paddling across the glassy sheen of Stone Lagoon trailing a bottle of sauvignon blanc (chilled en route) may sound like hipster lore, but the following excursions promise exactly such solace. And 'tis the season! On bluebird winter days, when tourists are slumbering in faraway cities, these destinations are ripe for solitude and romance. This year, sweep your Valentine off his or her feet with a sweet kayak picnic. Dry bag? Drag bag? Dirt bag? What now? When you venture into the life aquatic, keeping your dry stuff dry is paramount. Watershed brand dry bags, available locally at Adventures Edge and Pacific Outfitters, come in all shapes and sizes to accommodate your rolled picnic blanket and packed lunch. If you're on a Ziplock budget, double contractor bag it and go. Drag bags are much simpler — a nylon mesh laundry bag from your college dorm days can easily pull your vino across the water in style. To avoid glass containers, a 20-ounce Klean Kanteen holds exactly four glasses of wine. Fill 'er up, carabiner the drag bag to your boat and start paddling. Stone Lagoon is the classic Humboldt setting where the forest meets the sea. You'll be welcomed by the local Roosevelt elk herd and unassuming egrets and diverse waterfowl. To keep this foray simple and delicious, stop at the Beachcomber Café in Trinidad to grab provisions. Call ahead and the friendly staff will wrap up a delicious Snooty Hippie sandwich to share, chock full of hummus, avocado and veggies. Famously, though, there are no paper cups, so bring a thermos or travel mug to load up on their strong, organic coffee. Picnic in hand, continue north on U.S. Highway 101 to the well-marked Stone Lagoon Visitor's Center 40 miles north of Eureka. Kayak Zak's operates here year-round (Friday through Sunday in winter) and will outfit you with a kayak perfect for cruising the lagoon at $25 per hour or $40 for a half day. Consider upgrading to a 2-person boat and save money at $35 per hour or $70 half day. If you BYO-boat, you can unload right at the water's edge and then park. If time and relationship status allow, make your Valentine's date a longer trip and head to idyllic Ruth Lake. Located two hours east on U.S. Highway 36, Ruth Lake waits in isolation during the winter months. Matthews Dam, an impoundment on the Mad River constructed in 1962, forms Ruth Lake — take a moment to appreciate the spillway that forms a massive waterfall during the winter months. 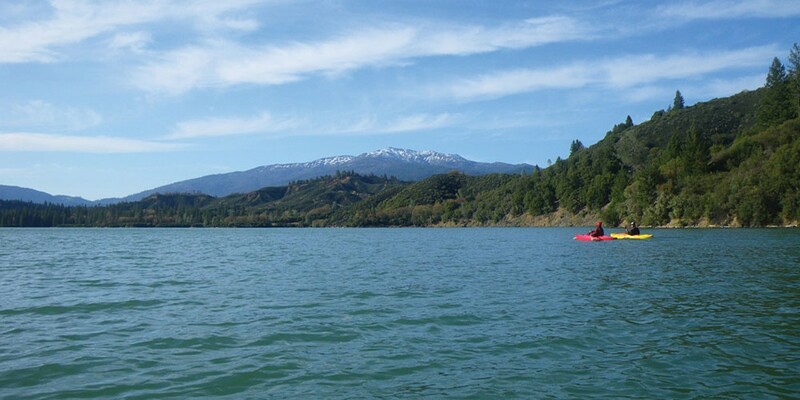 With snowy South Fork Mountain as its backdrop, the aquamarine lake has many secret coves to explore within its 27 miles of contoured shoreline. If you're pulling out all the stops, impress your Valentine with a DIY picnic that puts Pinterest to shame. Back at home, open two of those ubiquitous pint-sized Mason jars and insert a crisp piece of green leaf lettuce into each, topping with a dollop of cocktail sauce, a few peeled bright pink shrimp and repeat — voila, Mason jar shrimp cocktails. Pack some fancy crackers, a wedge of Cypress Grove's Truffle Tremor, local apples and your Swiss army knife. Round out the luncheon with a non-glass bottle of something red and fruity (when in doubt, go pinot), tuck a bar of fancy chocolate in your PFD (personal flotation device) and you're halfway to wooing. Launching your kayak from the marina, located 2 miles south of the dam on Lower Mad River Road, is your best bet. Alternatively, drive another 4 miles to launch at the Ruth Recreation Area campground; you'll need to check in here regardless, as Ruth Lake is managed for the invasive Quagga mussel and boat inspections are required Monday through Friday from 8 a.m. to 1 p.m. for a $3 fee. Call 575-6196. Most other businesses and services here are closed from October to May, meaning that in contrast to the hubbub of summer, you'll have plenty of solitude. Due to its higher elevation, Ruth Lake can be chilly, so dress in layers and bring a few extra blankets to keep your Valentine warm.